Prairie State College Library celebrated National Poetry Month with poetry cranes, displays, magnetic poetry and by sharing your haiku with us on the library chalkboard. A big thank you to everyone who participated and spread the word! Our next library chalkboard question is, “What are you plans for summer?” Stop by anytime to let us know, we’d love to hear from you. p.s. The poetry magnets are on the chalkboard by the library carrels. They are there for your use whenever the creative spirit moves you. April’s Book of the Month is The Invisible Life of Euridice Gusmao. 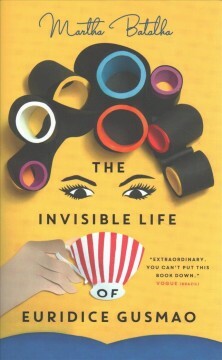 The Invisible Life of Euridice Gusmao is available for checkout at the library. If you read it, let us know! Follow the link for a printer-friendly booklist with readalike books and authors. Happy reading! Stop by the library today to write your answers on the chalkboard, ask us a question, or pick up a free poetry crane— the library’s got it all! It looks like Morgan Freeman is the winner, although he did face a surprising amount of competition from Robert Downey, Jr. This April, we invite you to write a haiku on the blackboard. A haiku is a three-line poem with 5 syllables in the first line; 7 syllables in the second, and 5 syllables in the third line. It’s all part of our celebration of National Poetry Month happening all month long. We’d love to hear your thoughts on haiku, other forms of poetry, or anything else, so stop on by whenever you get the chance! What are you going to do on Spring Break? The answers are in! … and sleep wins by a mile, but our favorite is *vote. * Illinois Primary Day is tomorrow, so don’t forget to do your civic duty before heading off to class. Be sure to stop by the library to answer our next Chalkboard question: “If someone narrated your life, who would be your narrator?” Answers are fun, free, and for all to see! It’s spring break time here at Prairie State, and time to catch up on that most elusive of pastimes for busy college students– reading for pleasure! Our recommended read for March is Jacqueline Woodson’s Another Brooklyn. Book description: “August returns to Brooklyn to bury her father, and a chance encounter with a friend in her old neighborhood prompts a flood of memories from her youth. Her memories explore what it was like to be an African-American girl (and teen) in the 1970s, what possibilities existed — and what challenges. This tale of friendship, love, and loss cuts back and forth through time.” — Description by Shauna Griffin. Another Brooklyn is a 2016 New York Times Notable Book, a Booklist Editor’s Choice for adult and teen fiction, a recipient of the Black Caucus of the ALA’s award for fiction, and a 2016 National Book Award finalist. Another Brooklyn may be checked out from the Prairie State College Library. Last day to enter the library’s Oscar ballot prediction contest! A reminder that today is the last day to participate in Prairie State Library’s Oscar Ballot contest. Every right answer is another chance to win a $5 Marcus Theatres gift card. Getting all the winners right gets you a chance at the grand prize of a $35 Marcus Cinemas gift card. You can fill out the online form or stop by the library until 2 p.m. to cast your ballot. Good luck! This month’s recommended read is Louise Erdrich’s Future Home of the Living God. Click here to read an interview of Louise Erdrich by Margot Atwood, author of A Handmaid’s Tale. If you like this title, we definitely suggest reading (or re-reading) this modern dystopian classic. Click here to download our flyer with a list of readalike books and authors.